This is the first of the two cookbooks I just finished recently. Both of which were inspired by the fabric. It's an 8.5" x 11" cookbook with double 6 -0-wires. I had left over material and made a matching square hot pad and a felt slip cover that fits both the book and the mitt. The inside pages are coordinated into four parts: appetizers, soup & salad, main dishes, and desserts. You can see in the photos below the dividers and the pages. 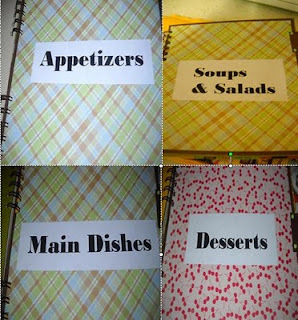 Each section has a slightly different colored page that matches the retro cooking theme of the fabric cover. 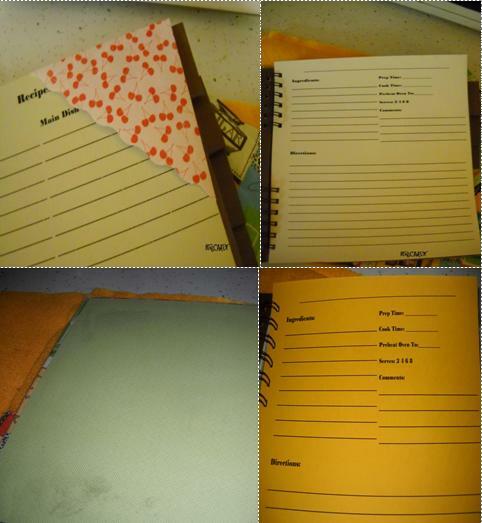 I tried out a new glue adhesive while making this book. Needless to say I wasn't over all thrilled with the results. As you can notice on the second set of pictures (set of four on the right side - bottom left picture) the glue came through the paper and stained it in the top and bottom corners. Overall, it turned out to be a pretty retro cookbook. Just a little disappointed with the adhesive marks, but lucky they are on the inside cover and I've been thinking of a way to cover it up or leave it as is. I was quite please how every other aspect of this book came out. I just love the colors, don't you?